Nevertheless, good preparation and follow up can improve chances that the strategy meeting becomes a success which everybody is willing to repeat after a year or two. I was involved in the organization of several strategy meetings for two completely different firms. Here is some practical advice that builds on this experience. Why still hold strategic planning meetings? For many businesses, a formal strategic planning meeting forces upper and middle management to systematically think and talk about strategic issues for the first time. If halfway properly planned, the preparation for this meeting encourages middle managers to put away their daily business for some quite hours and to think about the bigger picture. How many of them are so busy with their day-to-day workload that they hardly take the time to think about the long-term prospects of their field of responsibility in the larger context – even if they would like to do that. The meeting normally brings together the whole top management team and more or less members of the middle management. This might be an excellent opportunity to bring some ideas or problems to the attention of the whole management team and even to get some immediate attention, discussion and response. It is no rocket-science: good preparation is the key to success. I have made the experience that it is most important to talk to the top management about their expectations at first. Good communication is important too. It is essential that everybody involved knows the overall picture and how he fits into it, what he is supposed to do and by when he is supposed to do it. To point is to make busy managers to buy into something that takes away their time from their other duties and that potentially leads them onto unfamiliar of even threatening grounds. This is a very important part of the preparation. You need a critical mass of people involved with at least a basic understanding of strategy and strategic thinking. It is unrealistic to expect that the whole management team consists of experienced strategists. However, some of them (preferably the more senior ones) should have a clear idea about what is subject of a strategy meeting and what not and about how these issues should be addressed. Otherwise you risk ending up with a discussion about almost anything widely related with the future of the company, but not necessarily of strategic importance. I prefer some consistency in the way strategic analyses are done and strategies are presented – both over time and across the organization (i.e. across all business units, region or whatever planning units there are). This helps to achieve a certain level of quality and makes results more comparable. The downside is, however, that this sort of consistency tends to even out the differences between the several business units. The more diverse your organization is, the more resistance you will meet with a standardized strategy presentation of the one-size-fits-all type. There is no one right answer to this issue. The solution depends on the type of the organization and top management’s expectations. In any case, it is helpful to think about this question in advance. This leads to the question of complexity. In large and complex organizations it is important to determine the level at which you want to discuss strategy. If a large organization really intends to discuss strategy at the level of each product line, it may easily end up with a whole week of strategy meeting. The preparation of a complete set of files for all participants alone can become a major challenge in such cases. Last but not least – routine. The problem of routine brings us back to the above quote which compares strategy meetings with rain dances. I almost never experienced such a rain dance- attitude in first-time strategy meetings. The problem arises if companies exercise one and the same type of meeting year after year. After a few years, everybody knows what he is expected to do and everybody has learned how to prepare a presentation that meets the CEOs likings and avoids critical questions. Moreover, it is complete nonsense to expect groundbreaking new strategic ideas every year. In the end, a strategy should be a bit more long-term. A company I worked with solved this problem by shifting focus every year. One year they focused, for instance, on their options to improve their position in Asia, and next year they focused on technology. The process related to a strategy meeting is not over the moment the meeting ends and everybody leaves the room. Even if the meeting was considered a great success, without equally good follow-up it won’t deliver the best results. It is often helpful to be able to reconstruct the reasons and arguments that led to a particular decision of conclusion later on – for people who were at the meeting and also for those who weren’t. I often found these discussions highly interesting and full of valuable information, e.g. about markets, technologies, competitors and so on. If these details are taken down, the minutes (or parts thereof) are an excellent means of spreading such information throughout the company. They may be helpful for the preparation of the next strategy meeting. Nobody will remember all aspects of a strategy discussion after a year or longer. Last year’s minutes can help to reveal issues that were heavily questioned or remained undecided. These areas might deserve a more careful preparation the next time. The first step is to compile all tasks into one extensive list which can be sorted as needed, e.g. by topic, by due date, by status. Then the tasks should be arranged by responsible person and everybody who was assigned a task gets a complete list of his/her particular tasks, including due dates. This may look like a bit of red tape and not everybody will need it. But there are some good reasons. First, you cannot always be sure that everybody who was assigned a task was present at the strategy meeting or did receive the meeting minutes or did identify the task for him in the minutes. Moreover, it also is a bit of a support tool for the responsible persons. Their personal list of tasks assures them that they have the correct and complete knowledge of what they are expected to do. Thus there is no need for them to work through extensive minutes and to hope that they really identified all their tasks from it. If most tasks are short term and time-critical, the status should be collected monthly. With more medium to long term tasks the frequency can be longer, for instance every three months. This is also advisable if there are a high number of tasks. It is probably ineffective (and not motivating) if people are requested to report about ten issues every month. A limited number of tasks can be followed up in a fairly informal way. It may be enough to ask for a brief info by mail or even in a phone call. If there are a large number of tasks, there is probably no other way then to send out standardized status requests. It is easy to collect a pile of status reports. Their value, however, depends on what is done with them. The most straightforward thing to do would be to compile a nice list with all tasks and their latest status and to forward all that to the top management team. In smaller and less complex organizations this may work out fine. Top management will probably figure out potential problems and initiate some actions. The more effective way is, however, to give somebody not only the task to collect all status reports, but the authority to critically question them. Ideally this should be somebody from the strategy team who is able to understand the meaning and the objectives behind all those tasks, and to see the interrelations. This person should also evaluate if the results achieved so far meet the original objective of the task. This is especially important in cases when the responsible person doesn’t agree with the objective of his particular task. More than often I got status reports in which people explained in great detail why it doesn’t make sense to follow this task at all. The status list would only be an attachment for this. 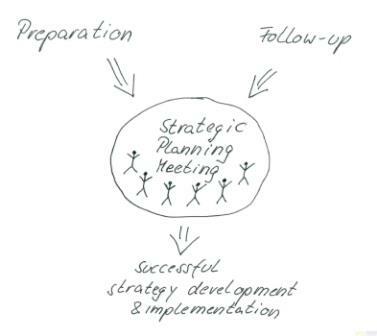 There are a lot of things involved in the planning and realization of a strategy meeting. The issues discussed above are no ready-to-use solutions. It was my intention to highlight some aspects that can contribute to a smooth and successful process. They are worth thinking about in advance. It increases the chances that people buy into it if the whole process is designed to meet the particular needs and expectations of the organization. In this book, The Boston Consulting Group’s Martin Reeves, Knut Haanæs, and Janmejaya Sinha offer a proven method to determine the strategy approach that is best for your Company. Faulty preparation invariably leads to unproductive strategic planning meetings and to serious problems with the implementation of the plan’s resultant strategies. Clearly, a well thought out process of pre-planning would be beneficial. This is exactly what strategy consultant Bill Birnbaum presents in this book. Chris Ertel and Lisa Kay SolomanGreat strategic conversations generate breakthrough insights by combining the best ideas of people with different backgrounds and perspectives. In this book, two experts “crack the code” on what it takes to design creative, collaborative problem-solving sessions that soar rather than sink. This book will help you master the principles of “strategic illustration,” a proven system for visualizing ideas. Pictures and strategy come to life in the board, conference, or meeting room quickly, easily, and brilliantly.